-For the Fourth of July holiday, San Francisco-based independent agency Butler, Shine Stern & Partners released a video celebrating 24 years of “independence from the heavy, calloused, totally uptight hands of mega-huge holding companies” and “dogs roaming the office with absolutely zero regard for personal space” (video above). -Director Michel Gondry shot the ten-minute “Détour” using only an iPhone. 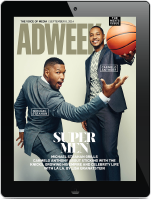 -Adweek speaks with “the NFL’s Most Creative Entrepreneur,” Green Bay Packers tight end Martellus Bennett. -Movie marketing agency JustWatch hired Aaron Wahle as senior vice president, marketing and business development. -PODS Enterprises, LLC, “the leader in portable moving and storage solutions,” appointed MullenLowe Mediahub as its media agency-of-record, following a review.